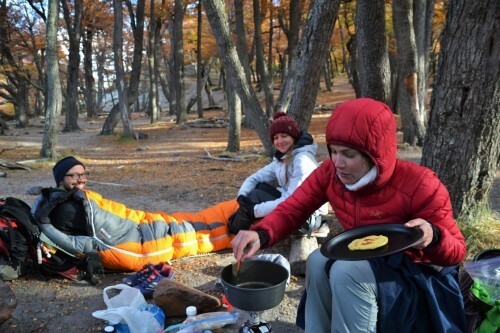 After our hike in Torres Del Paine we acquired the taste for hiking in the cold … Not. 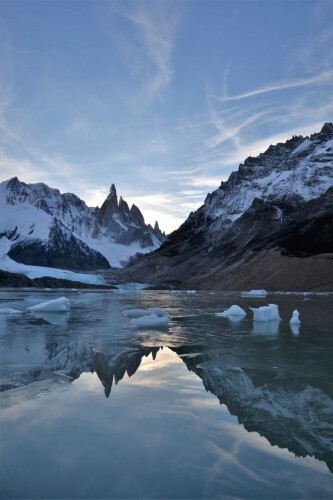 But, one does not go to Patagonia and skips El Chalten and its notorious mountains Fitz Roy and Cerro Torre. As we are not yet able to travel in time we arrived here also at the end of the season. This means the lively village hosting 3000 people in summer was at this time inhabited with only 400 wandering souls. Nevertheless we could clearly distinguish some tourists from the die-hard habitants who stay during winter in this desolate town in the valley, so we didn’t have the feeling being too late. 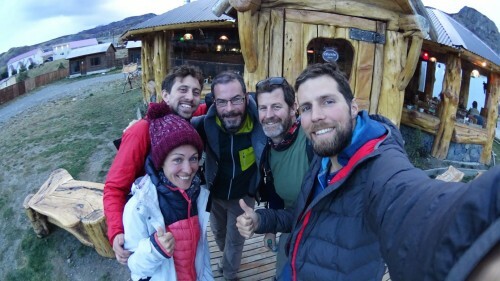 We also gave Dana and Doug, our newly acquired hiking friends, a ride from Puerto Natales so we had fellow companions to hang out with. The small fear of having a hard time crossing the border with two Americans in the back (expecting a total car search and interrogations) seemed unfounded. 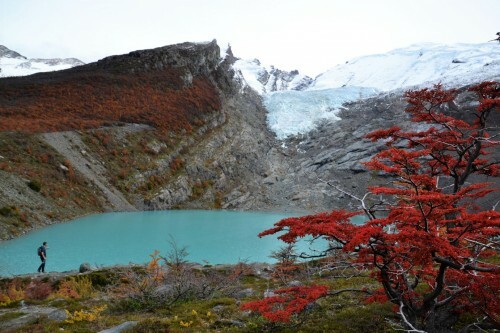 The first days we started off easy with a small hike to a mirador for sunset and a visit to Lago Desierto and its Glaciar Huemul: green blue water, autumn-coloured trees and white-blue glaciers. Not too bad as a warm-up. But we still had to start with the real stuff. 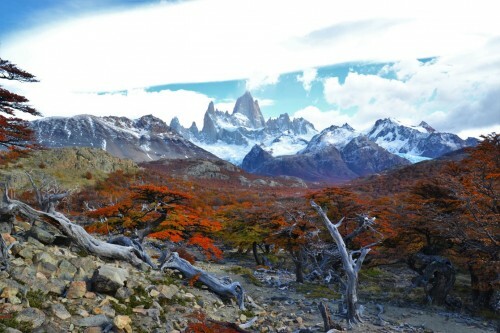 First on the list: trekking to Laguna de los Tres aka “Fitz Roy trekking”. 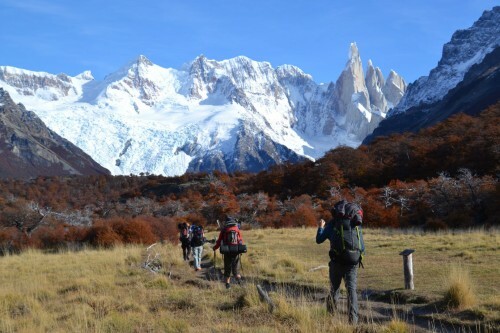 An 8-hour return hike through a gorgeous valley with amazing views on Fitz Roy and its surrounding mountain buddies. The view from the ‘mirador’ easily deserves a spot in our top views we had during this whole trip already! A climbing challenge for complete nutcases whom are not afraid to die, is to climb the whole traverse in a couple of days. It must be noted that we are talking about 3400m high peaks, numerous vertical walls and snow-/ice covered areas. I wonder what sleeping on the edge of a wall must be like. Only up close you can really understand this endeavour. Note that this has only been done once, in 2014. 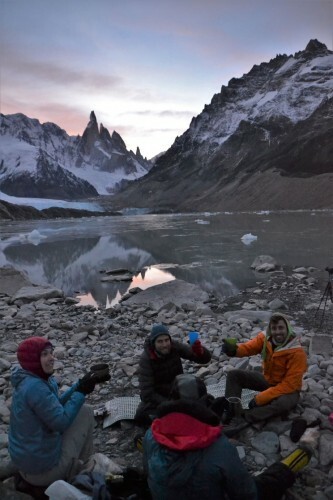 During and after the hike, we ran into Sebastian & John, our other hiking friends from Torres del Paine, so of course we needed to have another goodbye beer! Being one of the more beautiful hikes we have done so far, Céline was very glad she fought her illness and joined this hike. Although she stayed in bed for the following 2 days, it was worth it she said. Meanwhile I went climbing at the local climbing club (and even mastered to climb a crack in an enormous boulder outside the club! My first! 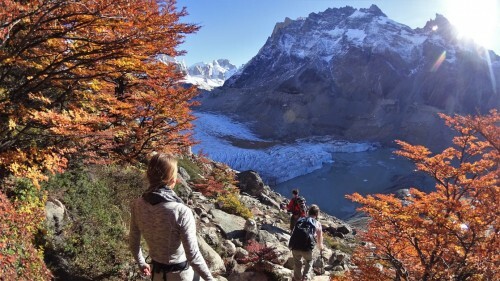 ), buying pills at the pharmacy for Céline, playing drinking games at the hostel, but most of all preparing for our next adventure: the Glaciar Torres hunt! Pack everything: tent, clothes and all the above. 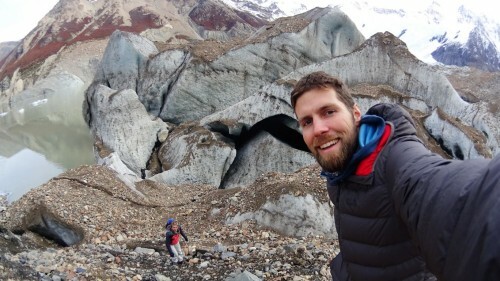 First of all, Nicco, an Italian Icelander, 25yrs old, a glacier guide in Iceland. On this trip for ‘holidays’ (read: walk some more on the ice for fun!). 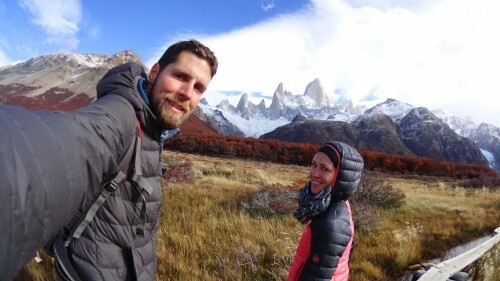 He visited Patagonia for a glacier expedition on Glaciar Grey (to look for ice caves and conduct measurements) which we saw from above during our hike at Torres Del Paine (see previous blogpost). 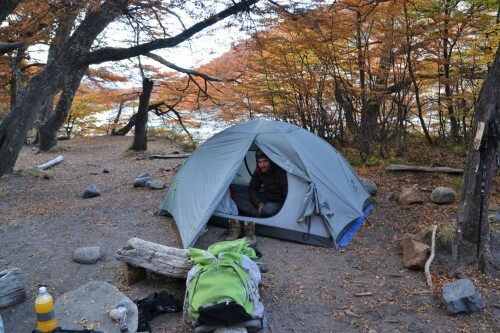 At El Chalten he wanted to do a hike on Glacier Torres and camp next to the glacier. Only with a little, small, barely noticeable self-inviting push from my part, he was willing to take our unexperienced asses on his trip. Thanks again Nicco! Second, Doug, 28yrs old, a PhD science student in California. Passionate about science, the outdoors, but even more for hunting the best sunset or sunrise picture. To be able to hunt for both, it takes a shitload of energy: Stayed up late for star pictures and got up in the dark for the best sunrise. If you lost Doug, and his camera was gone, you knew he was out hunting. And this doesn’t even cover half of it. 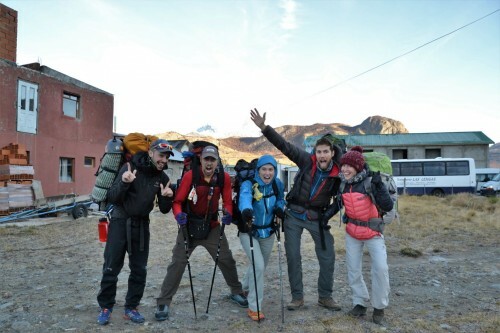 Together with the two of us we were all excited and ready for the 3-day expedition! After registering at the ranger office we got on the road. 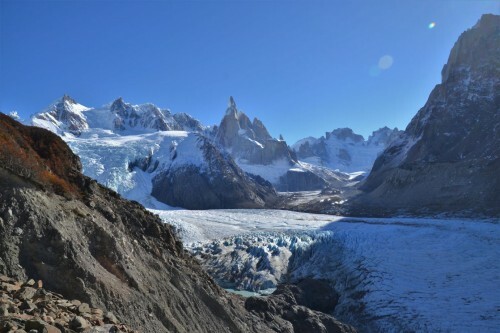 The hike to Laguna Torre was again a nice one with the first views on the impressive Cerro Torre about halfway in the trek. Amazing to see where we were going to camp. Despite being an easy trek we arrived quite late at the lake (due to the lengthy registration at the park rangers and the weight of our backpacks). Nicco made the wise suggestion to camp at the lake instead of next to the glacier. Reasons where numerous: it was going to take a long time to the valley where we would camp + not even sure we could access the camp + it would be much colder there (predicted -15°C). So we have set up our tent, left our bags and went on. We hiked for two hours next to the lake on the rock fall to the part where the glacier starts. We went a couple of meters on this first part and as it was getting late, we evaluated the possibilities/routes for a safe passage to get on the glacier for the next day for a hike and maybe an ice climb. 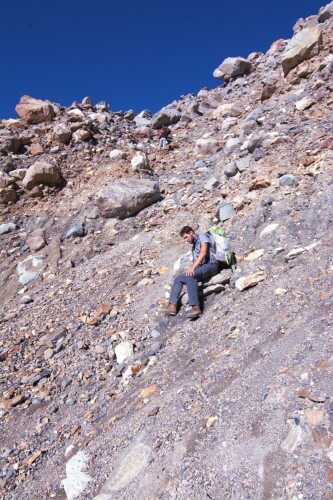 Since Nicco didn’t see a safe passage on this side, we were planning to try to access from the other side tomorrow. Let’s see! So only a small close-up of the glacier today, but the evening cooking at the lakeside with an amazing sunset over the mountains made definitely up for that! The second day we got up early for the sunrise which was very nice to say the least. After breakfast we buckled up our harnesses and went again towards the glacier. First obstacle this side was a river crossing on a rope. 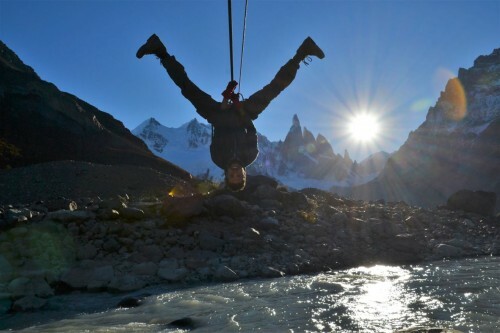 We felt really adventurous, hanging there upside down, to cross the ice cold river. Mission accomplished! Next, we hiked for 3 hours on the side of the mountain next to the lake and glacier, crossing landslides, climbing down rock falls, trying to find a safe path to the glacier. Here and there some old passages were marked, but landslides and rock falls destroyed most of it. After this effortful attempt the ‘path’ ended with a too dangerous rappel down, which would be nearly impossible without climbing experience to get back up. With the wise words of Doug “you know when to fold”, we decided this was the end of attempt n° 2. Nevertheless it was an amazing experience and made us all realize that expeditions in the mountains, on glaciers, … are the real deal and is totally something else compared to hiking on a ‘paved’ trail! Lesson learned! Moreover, we had a great lunch spot with an amazing view on the valley and its glaciers. And even more, we had to pass the river once again on the way back! 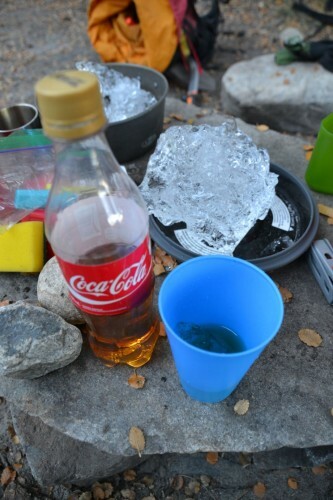 To celebrate the nice day, we had whiskey with our personal hunted glacier ice from the lake (thanks to Nicco, again!). Impression of the camp: in the forest 100m from the lake, freezing temperatures during the night, dark around 7:30PM, so any living soul gets in the tent at a reasonable hour, which is 1h after sunset at the latest. But not for star shooting Doug of course! Unfortunately, the local mice also preferred the warm tent compared to the cold outside… or were they aiming for the cookies that didn’t make it to the “bear hang”. Tent vs mouse: 0-1 (or 0-5 if you count the number of holes in our tent and backpack). The last day was a sleep in one. Again, not for Doug who got up for the sunrise from an even better angle! One must admire his courage and we all were jealous of his pictures of course :-). Dana had the fantastic idea to bring pancake mix so we had a nice pancake with honey brunch. After this we packed and started walking if we didn’t want frostbite on our toes. Especially mine! I always explain it with being the tallest and this a very distal part of my body. Don’t know if that’s accurate, but at least it was me who had the coldest toes. Walking definitely improved blood flow and after 4 KM’s or so I could feel them again. 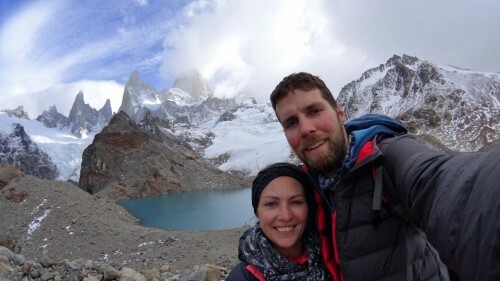 Dana & Doug took another way back (read: hiked 5h longer to see Fitz Roy) and we met again in the evening to have dinner all together to celebrate our expedition. A glacier expedition which in my mind was definitely a success (except for the small detail that we didn’t hiked ON the glacier)! But what a great team we had! Note: The dinner was – as usual after hikes – way too much. Burgers this time. That’s all folks! 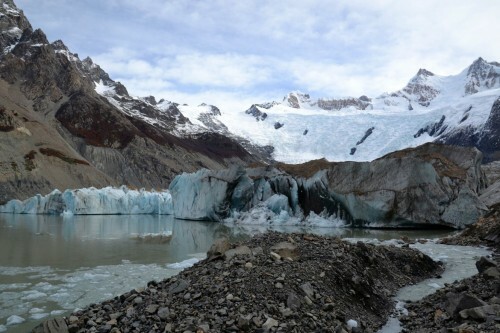 … for El Chalten at least. Great time with you guys! I’m glad we made it happened, it was a full experience of dealing with Nature. “Great for being your assistant-guide”, says Céline.